Almost all young boys harbor the dream of becoming football managers when they grow up. This profession does pay very well, however it will require you to work very hard. If you wish to become a football manager, you must ensure that you are physically mentally as well as emotionally strong, if you are not fit and mentally capable then you will never be able to make a good manager. 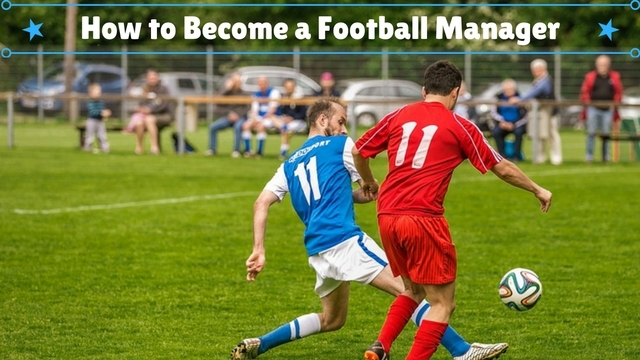 If you are sure that this is what you want to do in life, then there are certain distinct steps which you need to follow along the way to help you become a football manager. Almost all children play games online where they pretend to be big football managers who take care of top football teams and clubs. Though while playing the game this job might sound like a dream. In reality it is certainly not so. Even before you start looking for jobs as a football manager you must be aware that such jobs are not many in number. In addition to there being not many jobs, those who are interviewed for the job are taken on board only after a great amount of screening as well as background checking. So do not expect things to be a catwalk. Success comes to those who work very hard for it. In this profession too, if you wish to make it to the top you have to be willing to work round the clock. To become a pro football manager you need to be someone who is good at communication as well as someone who has a commanding presence. Football managers are people who are responsible for taking care of a number of things simultaneously so ensure that you do know how to multi task. If you are unable to handle pressure in a proper and effective manner, then you will crumble under pressure and as a consequence your team will suffer a lot. To become an excellent football manager it is important that right from the onset you show yourself as someone who has tremendous confidence. A football manager is someone who is responsible for doing a number of things like signing on new members to the team, buying new players, selling off other players and even promoting players from the junior to the senior team. If a manager is someone lacking in confidence, then he will never be able to take smart decisions. When being a football manager, taking smart decisions is not merely enough taking quick decisions is also necessary. To get basic experience it is always a good idea to apply for a job at your local football club before you apply anywhere else. If you instantly want to start by applying to a top club or team you will never be able to bag a job. Having good credentials is something which is very necessary when you plan to make a mark in the football world. The moment you find that there is a job opening available in the local club, apply as soon as possible for the post which is available. Any delay in your part will cause the opportunity to be lost. As it has been mentioned above, applying to your local football club first is a very good and smart idea indeed. When it comes to being a football manager there is no big or small job. All teams have a lot of requirements so you should not think that applying at a local level will be a tremendous waste of your time. If you are unwilling to start from the bottom, then you will not be able to make your way to the top. A long as you are positive, in time to come you will make your way to the big teams. All you need to do is be patient and work hard. People across the world have this conception that those in the sports field have a lot of honesty and sportsmanship, however once you have the experience of being a manager you will understand that things are always not as they might seem to the outside world. Irrespective of how you see others behave and act, you should always let your conscience be your guide. To become a good, popular as well as respected football manager you must always be on the side of truth. Once you are involved in any kind of fraud, your career will surely be over. Prior to actually getting a good job, in order to qualify to apply for the job it is imperative that you do a course online. Nowadays there are plenty of courses to choose from online, so do spend some of your spare time browsing the internet and choose any course which you think is best suited for your needs. The higher qualified you are the more chances you will have of being able to bag a job. Once you do your online course be sure to get certified so that you will have the designation of being a certified football manager. Football manager always have a lot on their plate, so if you wish to become someone who is a very successful football manager then right from the onset you should get into the habit of maintaining a notebook or even a diary. Rather than forgetting what you need to do, it is always a good idea to write it down so that you can get back to it and attend to it at a later point in time This is indeed a sensible things to do. If you do not wish to maintain a book, you can always create files on your laptop or phone to help you remember small details which you otherwise might end up forgetting. Without a thorough understanding of what your job happens to entail you will never be able to be a good and proper football manager. To really help you become a good football manager you must be familiar with every responsibility which you have and all matters which you as an individual are expected to look into. Rather than trying to handle everything on your own, do keep an assistant who will be able to help you along the way. However do not indulge too much information about the team to anyone else, keep everything to yourself. Very often, it is usually the football players who manage to get the most attention. From the very onset, if it is your dream to become a football manager then you must acknowledge as well as accept the fact that you will not be in the spot light for most of the time. Your job involves a great deal of background work. If you are someone who craves for attention and spotlight, then this is certainly not the job for you. It is rather unfortunate, that when things go well, no one really remembers the team manager, however the moment things start going wrong with the team the first one to be blamed is the manager. If you wish to become a football manager then it is vital that you learn to keep your mind active at all points in time. If you mind is not active then you will never make a good football manager. To keep your mind active you should play some games in your spare time or even do some puzzles which can really help you along the way. In addition to this mentally prepare yourself for the fact that your job will entail a lot of travel as well. So if you are someone who likes to spend a lot of your time with your family then this is certainly not a career which is meant for you. If you are thinking about ‘how to become a professional football manager’ then you should take help from others who have made it big as football managers rather than trying to do it all on your own. Even if you do not know any football managers personally you can always read about them online and understand why they have become so successful and how he managed to do so much exceptional work in the course of their career. To help you improve yourself you should follow these managers on twitter and even on other social media sites so that you too can try and learn from them and improve yourself a great deal. To become successful in this career you must be willing to learn. At no point in time should you think that you are too experienced and smart to learn from what others are telling you. To become an exceptional football manager you must learn to have your head on your shoulders at all points in time. A good football manager is one who is informed and even attentive. So do make it a point to keep yourself up to date in every piece of information. A football manager never stops learning so make sure that you are someone who is thirsty for knowledge. To help you to become a great football manager you can download a few apps on your phone, these apps will update you with any important information or news in the football world. Once you wish to become a football manager in addition to paying attention to the needs and wants of your own team, you must be equally attentive to what all is happening in other teams. To see how a team is performing, it is important to not miss any games when it comes on the television. Watching the highlights of the game is not merely enough you should make it a point to watch the entire game and keep an eye out for the team weaknesses and even failures. This could help you when you are up against that team or when you wish to buy players from the opponent’s team. If you are unfamiliar with the rules of the football game then you will never make a good football manager. To assist you along the way, you must ensure that you have a passion for the game of football. This is the first things which will help you make a great football manager. Finally if you wish to become a football manager you must be willing to think out of the box and do things which no one else will imagine that you will do. This will really give your team an edge over the others. If you are thinking about how to get into football management, these are some of the simple things which you need to do as well as keep in mind. This is indeed a respectable job and entails plenty of sleepless nights. Do not opt for this profession if you are someone who is lazy and unwilling to go that extra mile. A football manager is someone who has many functions as well as responsibilities. Since there is no specific job description for a football manager, you must be willing to do everything which no one else is taking responsibility for. Once you do manage to make your way to the top, do make sure that you use all your powers in a responsible manner.